Coming Home to Yourself: Eighteen Wise Women Reflect on Their Journeys honors the changing face of aging and shatters stereotypes about older women. The diverse, multi-cultural group of women featured in this book are vital, resilient, and continue to grow. They’ve all experienced a turning point later in life, which has brought them home to their deepest selves. No matter what their culture, religion, lifestyle, economics or personal challenges, all the women arrived at the same internal destination: a place within themselves of comfort and familiarity, of harmony and wholeness, and of acceptance and love for themselves. Their moving stories of self-discovery and empowerment will inspire women of all ages to continue their quest to find their own authentic home. 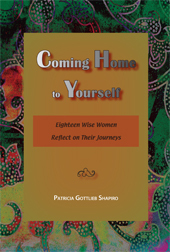 Coming Home to Yourself: Eighteen Wise Women Reflect on Their Journeys (Gaon Books) explores the many meanings of home to women as they age. Home can a physical place, an emotional space, or an activity where you can be yourself without masks or airs and be known for who you are. It is a haven within where you feel comfortable, safe and content: your internal and external selves matching, your inner and outer voices becoming one. Each of the 18 women profiled in the book, who range in age from 56 to 77 years old and come from diverse backgrounds, has experienced a turning point, insight or revelation later in life that has transformed her life and led her home to her deepest self. The book explores the process of her journey, the support she received, the detours along the way, and the sense of peace that results when she discovers or reclaims a true home.